With MMAC president Adrian Lloyd acting as driver and my grandson George coerced into the roll of official/unofficial MMAC photographer we made our way to Dracott Water. 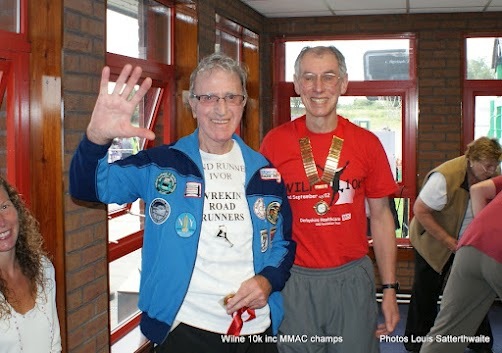 We arrived safely and in good time (despite my best attempts to misdirect us) to compete in the Wilne 10k. 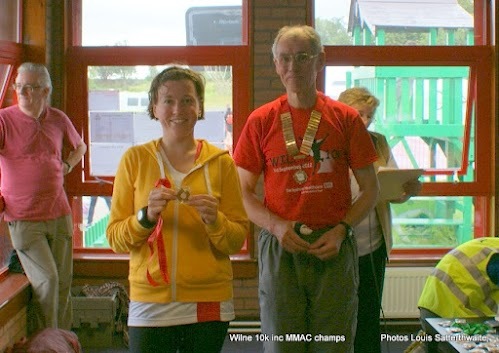 The task of picking up of race numbers and tags at the registration area was very efficiently organised despite some MMAC members including myself going the main race administration desk instead of the MMAC desk, Hands up all those who did this! At about 9:15 am the early cloud cover gave way to a beautiful sunny day, this was to hold out until about halfway through the race when cooler weather thankfully returned. 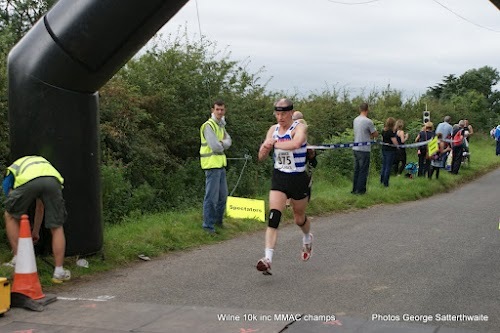 So with all the runners making their way .4 of a mile to the start I go through my dynamic stretching routine on the way down with people looking at me as though I was mad but I have run 37 races uninjured so far this year the most at 72 years of age as in any of my 35 years as an athlete so it must work! 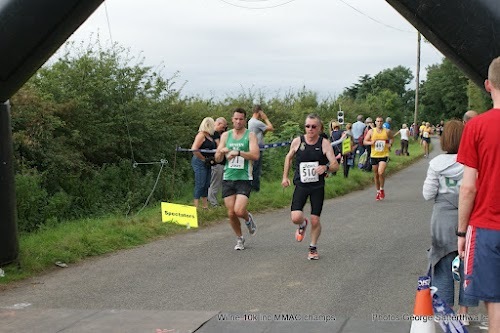 As the runners gather at the start I try to spot the two top M70 runners in the race those superb athletes Barry Swindells and Roger Wilson in the vain hope that I may hang on to them for at least part of the race as this was to be my longest road race for just over 5 years. 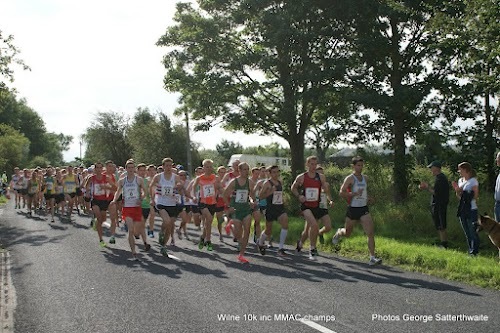 With the usual nervous prerace banter running through the crowd of 646 eventual finishers the count down began 5-4-3-2-1 and off we all went to the blast of the start horn. I got off the mark at a good pace and as the field settled down I spot Swindells tracking Wilson a few yards in front of me but as the race proceeded I realised that I could not match their speed by a long way and they gradually drew away from me, at about 3K Roger Wilson’s Stratford upon Avon team mate M65 speedster John Turner came past me with a word of encouragement this was to be the story of my race people passing me with words of encouragement, the next person of note to pass just before the 5k mark was team junior M50 Eric Robathan, 5k being about the limit of what my training conditions me for, but I trudge on with my pace dropping as more and more runners sail past, next to come past at about 7K was team mate Adrian Lloyd I tried vainly to hang on but he to drifted away from me. 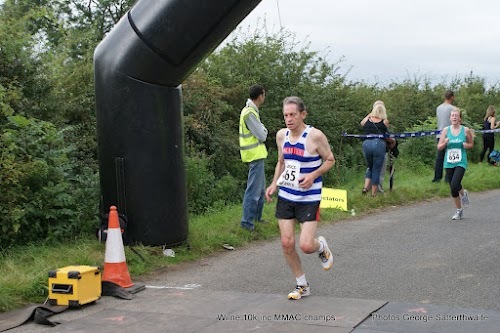 From then on it was just a matter of survival a goodish finishing kick brought me in on a gun time of 48:22 over three minutes behind the two top M70s in the race, life is very hard! 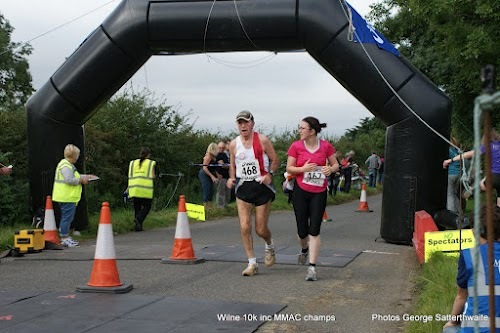 All in all this was a very well organised race with plenty of post race water available and a superb Wilne 10k race T-shirt in the goody bag which included some lipsticks that unfortunately were not my usual shade. 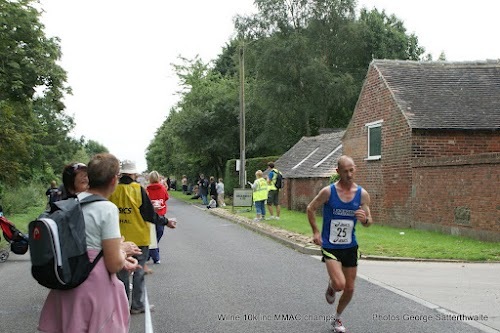 Gordon Lee M45 was the overall MMAC 10k Champion in a time of 31:34 with Stuart Nelson M35; 2nd in 33:14 with Tom Foulerton M35; 3rd in 33:35.